The definition of internally displaced persons is not a legal definition but simply a descriptive one. The rights and guarantees to which IDPs are entitled stem from the fact that they are human beings and citizens or habitual residents of a particular State. The "Guiding Principles on Internal Displacement", although not legally binding, are the main instrument specifically dealing with IDPs. They restate and compile human rights and humanitarian law relevant to internally displaced persons. Below is an overview of international human rights and humanitarian law standards that are applicable to IDPs. The conditions of danger and deprivation that characterise situations of internal displacement can take a tremendous toll: the highest mortality and malnutrition rates recorded in humanitarian emergencies this past decade have involved internally displaced persons. Uprooted from their homes, separated from their community support networks and often from their families, and thorn of their resource base, IDPs suddenly find themselves stripped of the most basic sources of security and survival. Compounding their plight, displacement exposes its victims to additional vulnerabilities and risks. Primary responsibility for assisting and protecting IDPs rest with their own governments. Should governments prove unable or unwilling to discharge this responsibility, however, governments are expected to invite or at least accept international assistance for ensuring the welfare and security of IDPs. In Bangladesh river erosion also causes displacement of several people every year, who are gathered in urban areas, especially in Dhaka. These displaced people have some special needs precisely because of their displacement. This is true whether they are in camps, have merged into urban slums, or are hiding to avoid identification. The purpose of paying specific attention to the plight of IDPs as such is not to confer on them a privileged status, but to ensure that their unique needs are addressed, along with those of other groups. 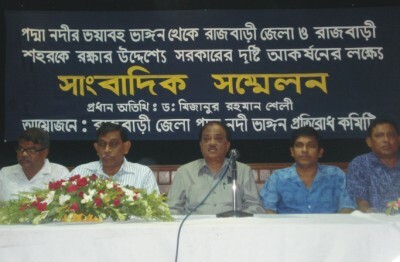 Recently in a press conference in Dhaka Press Club at May 10, 2008, organised by Rajbari District Padma River Erosion Prevention Committee, speakers urged for the different livelihood options for the people of Rajbari and asked Government to take necessary steps to control the mighty Padma. Brig. Gen. (retd) Md. Azizul Haque convenor of the Committee in a keynote informed the sufferings of these IDPs. It is one of the biggest rivers in Bangladesh, which often floods many areas. Like many cities Rajbari has also been built on a river, this river. History says that, Padma is changing its path and localities are changing accordingly. At the same time livelihood options are interrupted. The sub-division office of Railway is shifted to another place as river Padma grabs most of the area and people who are linked with the railway-centred trades and activities became jobless. This also incites displacement of people and people are forced to change their place for existence.